It’s hard to keep a band together for a year. It’s rare to stay together for 10 years. 20 is amazing. And 30, well damn… that’s a miracle. Brian Vodinh is one of the founding members of alternative metal band, 10 Years. He started off as the drummer for the band, but later switched to guitar. Some of his band members say he is a guitarist first, a drummer second. Brian started taking guitar lessons at the age of 11 years old. He grew up around music as his father was a first-chair violinist in a symphony orchestra and his mother was a huge Elvis Presley fan. Brian says growing up with rock ‘n roll meets classical helped shaped his style. 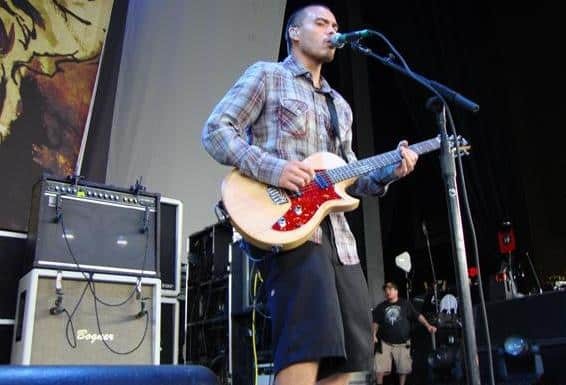 Brian’s guitar influences growing up was bands like Deftones, Metallica, and Korn. Brians says you can hear a James Hetfield-style in his guitar playing, especially in his right hand attack. What helped him develop that style was his determination to learn Metallica songs, especially Master Of Puppets at the age of 13. See pictures of Brian Vodinh’s gear taken from the Carnival Of Madness Tour at the DTE Music Theatre in Clarkston Michigan. 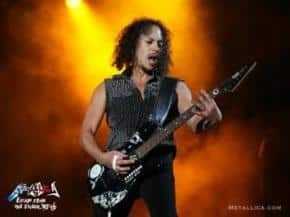 When Kirk Hammett, the lead guitarist of Metallica, was asked about his gear and tone for their new Death Magnetic album, this is what he had to say.